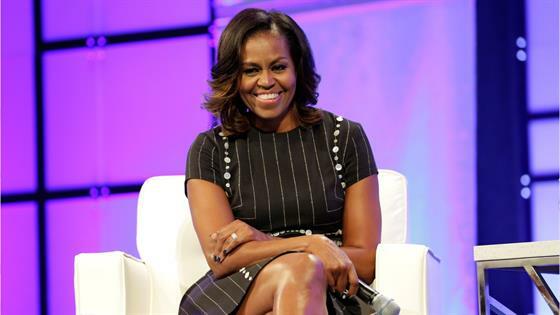 Although Michelle Obama has left her FLOTUS title in the past, she's maintaining her feminine and sophisticated style. In honor of the release of her book, Becoming, Barack Obama's better half has been traveling across the country giving surprisingly relatable advice, promoting her new work and sharing epic looks from her well-managed wardrobe. She may not be in a public office, but her style, which she and stylist Meredith Koop carefully curated during her time in the White House, has remained the same with clean lines and classic silhouettes at the forefront. "I never expected to be someone who hired others to maintain my image, and at first the idea was discomfiting," she stated in her book. "But I quickly found out a truth that no one talks about: Today, virtually every woman in public life—politicians, celebrities, you name it—has some version of Meredith, Johnny, and Carl"—her glam team—"It's all but a requirement, a built-in fee for our societal double standard." While her style may have stemmed from a need and double standard, her resulting style is universally appealing. Power suits, elevated denim styles, pretty pumps—if you want to look amazing and command respect, Mrs. Obama's closet is the perfect place to start. Check out the best looks from her book tour below! In Philadelphia, Michelle Obama opted for a bold, red suit with flared trousers. The lawyer went for a monochromatic look from Akris with grey pumps. Adding a little sparkle to her wardrobe, Michelle opted for an off-shoulder top featuring crystals and loose-hanging pants. The former FLOTUS opts for a suit, complete by the Safiyaa Greta Pinstripe Jacket and Dankia High-Waister Pinstripe Trousers. White just may be Michelle's color. For an conversation with Tracee Ellis Ross in Inglewood, California, she went for a long, white suit jacket and matching wide-leg pants. In Washington, Mrs. Obama kept it classic with a black suit, but added a feminine flair with hanging crystal details on on shoulder.